We ended the indoor season in our traditionally spectacular way...with a spectacular loss! A lovely, friendly afternoon at Welford, followed by tea and biscuits, made up for the score, which we have unfortunately come to expect. Final result was SE 66: W 116. Our winning rink was rink 3, where Sandi Cruickshank, Mick Lampard, Sue Birch and Mike Bell took the pens. Thank you all for your support over the winter, and see you all on the green soon! At one point it looked as if we might have a better result against Bromsgrove Indoor Bowls Club on Saturday but it wasn't to be! Despite their captain adjusting the score to account for triples against rinks on three of the rinks, we still lost. Studley Entaco 76: BIBC 109 was the final score. But we all had a most enjoyable afternoon, and the cakes were lovely (thanks again Chris)! The pens went to rink 4 as there's was the one with the least shots against. So well done to Joan Bell, Elaine Morgan, Bill McNeish and Kelvin Rice. We'll see if we can do better against Welford next week! ​We were subjected to a right good thrashing on Saturday at out first indoor match of the season against Bromsgrove. The welcome was as friendly as usual, reacquainting ourselves with old friends and rivals and the match was enjoyable despite the drastic defeat! Final score was SE 53: B 108. We didn't have a winning rink, so the pens went to the rink with the highest score and the least shots against...Rink 1. Well done to everyone for turning out and doing your best, but especially to Joan Bell, Heather Cheatham, Peter Holtom and Kelvin Rice. Let's hope for better luck on 12th January 2019! Things did not go smoothly at WCC on 15.09.18 when it was discovered, half way through the game, that the council had double booked the club house from 4pm, so we only played 14 ends. But the welcome and the match couldn't have been friendlier, and the food was lovely. However we lost overall, with the final score of SE 42: WCC 61. Our winning rink was rink 1, with Maurine Smith, Karen and Kelvin Rice collecting pens. There was an autumnal bite to the wind, despite the sunshine, when we played Crystal. We played on our green as there had been a mix-up with dates and Crystal were unable to book their hall for refreshments, so they came to us instead. I think they found our green challenging, as we won on 3 out of the 4 rinks with a final score of SE 80: C 72. Our winning rink was rink 5, with Joan Bell, Bob Perks, Sue Birch and Kelvin Rice winning the pens. The weather managed to stay dry and it was quite cool and breezy, but their green played very well and we enjoyed the match. There was quite a difference in scores on all four rinks, but overall we must have been equally balanced, as the match resulted in a 64 all draw! Rink one won the pens, which went to Maurine Smith, Peter Holtom and Dave Williams, with their score of 23:14. A good result for all. Sunday 2nd September 2018...Studley Entaco home to Westbury Blue Circle Touring team. ​What a great time we had on Sunday when the Westbury Blue Circle Tour team came to play us on our green. The weather couldn't have been better, nor the match tighter, although some rinks had some extreme results! We stopped for tea and cake half way through (thanks Karen! ), which didn't suit everyone, affecting play on some rinks and causing a "game of two halves". In the end Westbury won by only 6 shots. Final score SE 103 :W 109. Our winning rink was rink 5 with a score of 26:9, so the pens went to Pat Kenneth, Royston Andrews, Ian Thompson and Mike Varnam. Well done everyone. An amazing thing happened when we played Redditch on our own green...we won on all 5 rinks! It was a lovely, friendly game, and very close at times but the green favoured the home players. The weather was perfect too...a lovely afternoon and not too hot. Final score was SE 95: R 68. Our winning rink was rink 6, and the pens went to Sue Ginder, Phil Cheatham and Peter Creswell. Saturday 19th August 2018...Studley Entaco away to Bourneville. We did really well when we played a 6 triples match against Bournville on their green. An overcast but warm afternoon, and their green being heavy (like our own), obviously suited us! With a break for tea half way through we all left knowing we'd won on all rinks, but not the final score, so here it is...SE 112: B 70. Our winning rink was rink 1 so Sandi Cruickshank, Sue Birch and Mike Bell got the pens. On Saturday we played a five triples game against FISSC on our green. The weather looked very doubtful from the beginning but thankfully it held out until after the match finished. It was a very close game with both sides winning 2 rinks by large margins and the fifth rink was won by us, but only by 2 points. However the final score was in our favour; SE 81 : F 72. Our winning storm-away rink was rink 4 and Sandi Cruickshank, Bill McNeish and Barbara Jeffrey claimed the pens for a score of 33 to 3 against the opposition. It was a lovely, warm afternoon with a nice breeze when we played Bournville at home. The green had benefited from a nice drop of rain which made the play "interesting" but enjoyable! We only lost on one of the five triple rinks, which meant we won by a comfortable margin, the final score being SE 95: B 71. We had 2 rinks fighting for the pens but Mike O just lost out to Kelvin by one point, so rink 2 (Sue Ginder, Bob Perks and Kelvin Rice) got the pens. A most enjoyable afternoon all round. Saturday 28th July 2018...Studley Entaco away to Avon B.C. What a shame after all the lovely weather we'd been having that the match on Saturday against Avon got curtailed by rain! We'd only played 7 ends when the heavens opened, and although it did slow off briefly whilst we had our first cup of tea, it soon became obvious that we were not going to be able to carry on. 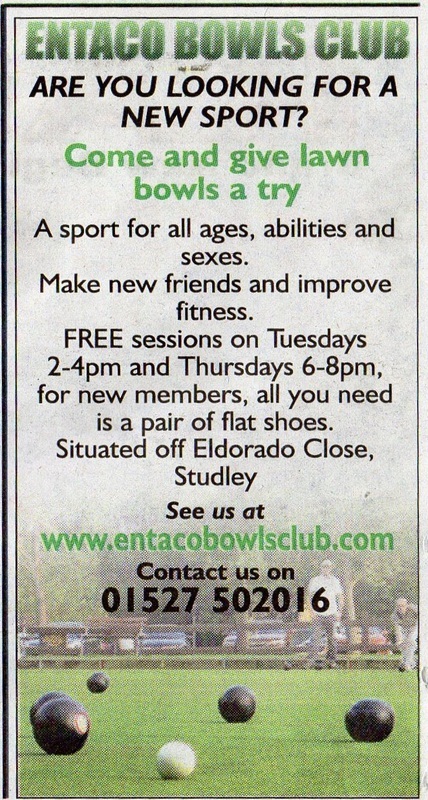 Up to that point Studley Entaco were winning on 4 out of the five rinks, and the final score was SE 39: A 24. Sue Ginder, Peter Holtom and Mike Varnam were awarded the pens on rink 1 and Peter Creswell joined us for the first time...here's to many more games Peter! Saturday 21st July 2018...Studley Entaco away to Wellesbourne. It was a hot and sticky day when we took to Wellesbourne's green. Four triples from each side played a very entertaining and friendly game on a green that played really well, despite the extended period of dry weather we had been having. And the result was nice too, as Entaco won on all rinks! Final score was SE 71: W 48. Our winners on rink 4, Pat Kenneth, Karen Rice and Mike Osborne, took the pens home. It was a warm, breezy afternoon when we played St. Barbara's. Everyone was enjoying the game until poor Edna had a fall and the match was halted for a while, to allow the paramedics to do their job. The game then continued and resulted in a win for Entaco. Final score was Studley Entaco 81: St' Barbara's 56. Our winning rink was rink 3 with Pat Kenneth, Royston Andrews, Karen Rice and John Crompton receiving the pens. Members from both teams wish Edna a speedy recovery. There was an unexpectedly chilly breeze on an otherwise lovely, sunny day when we played Droitwich at home. A very close match was enjoyed by all, as was the buffet that followed. Although we won on three rinks and lost on two we just lost the match by 2 points overall. Final score SE 88: D 90. Our winning rink was rink 1 this time, and Joan Bell, Karen Rice and Dave Williams received the pens. A minute's silence was observed in memory of Neil Brereton before we began out 6 triples match against Hewell on Saturday There was a short shower just a few ends into the game, but thankfully the weather came good soon afterwards, and the rest of the match was enjoyed by all. Studley Entaco were again victorious with the final score of SE 102 : H 89. The pens were awarded to Sue Ginder, Bill McNeish and Mike Osborne on rink 3. 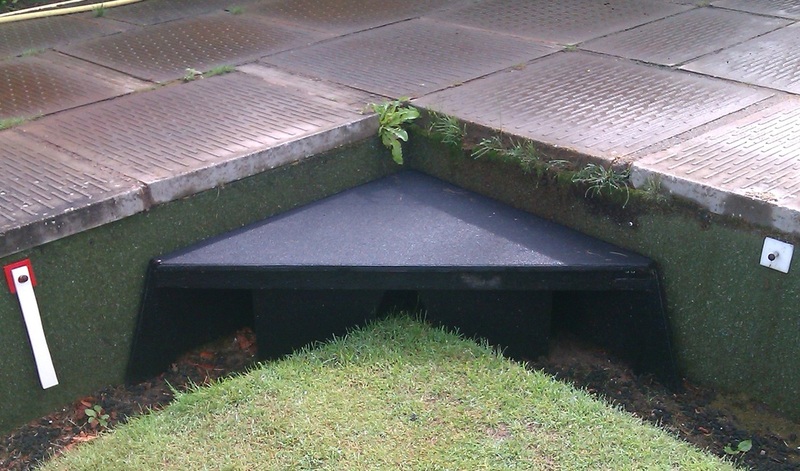 We were not so lucky on Saturday when we took to the green at Stratford-on-Avon bowls club. It was a lovely, warm afternoon again, but the weather didn't help the cause this time. We lost on all but one rink, which was rink 2 and Fred Lakin, Mike Westell and Elaine Morgan got the pens. Final score, SE 76: S-o-A 118. A lovely american supper was provided by the Stratford team after the match, and it was enjoyed by all. Wednesday 6th June 2018...Studley Entaco home to Inkberrow. It was Inkberrow's turn to visit us this year, so we played a five triples match on this evening. A very sunny and warm evening was enjoyed by all, as was the supper of hot dogs provided by Margaret and Derrick Pratt (many thanks). 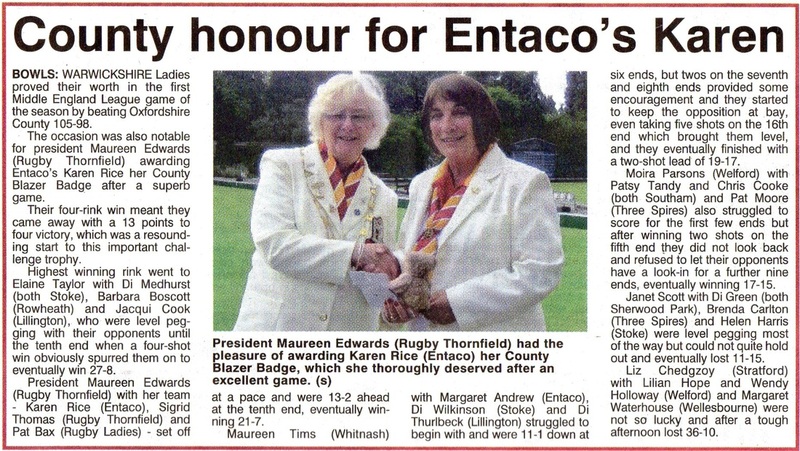 The score was also enjoyed by Studley Entaco as we won again! Final score SE 82: I 64. Our winning rink, rink one, was once again skipped by Dave Williams, and the pens were awarded to him, with Edna Ward and Ian Thompson also benefiting. Well done everyone. It was a lovely afternoon, almost too lovely! when we took to our green to play the first of our two annual matches against Wellesbourne. It was just 4 triples each, but there seemed to be as much chattering as ever as old friends met up for the afternoon. With a nip and tuck start on most rinks it was hard to see who would win, but in the end Entaco won on all rinks, with a final score of SE 82 to W 52. Our winning rink was rink 1 this time and the pens were awarded to Joan Bell, Ian Thompson and Dave Williams. Our second game against Kings Heath looked doubtful during the morning, but the weather cheered up and was quite pleasant by the time we took to their green on Saturday. Their green was challenging, as were some of their teams!There were some big differences on most rinks apart from the draw on one. In the end Entaco endured and we won SE 85:KH 66. Our winning rink was rink 4 with Edna Ward, John Compton and Dave Williams receiving the pens. It was a lovely afternoon when we took to our green to play the first of the two fixtures against Kings Heath. Everyone enjoyed themselves and the scores were relatively close on all rinks, but the final victors were us! Studley Entaco scored 86 points to Kings Heath's 72, and our winning rink was rink 5. Elaine Morgan, Bob Perks and Mike Bell received the pens for their efforts. On Saturday we revived a fixture against Solihull Municipal Bowls Club. This fixture hadn't been played for many years, so we made a special point of welcoming their members to our green. We played 5 rinks, and the weather managed to stay dry for us, if a little on the cool side. Tea and cakes were enjoyed by all. Some close results ensued on some rinks, but the final score was a victory for Studley Entaco, with SC:98 to SM:75. Our winning rink was rink 3, and the pens were awarded to Edna Ward, Tony Howlett, Sue Birch and Kelvin Rice. Looking back over the last few years results I realised we have never won this fixture against Brotherhood...and Saturday was no different! However the weather made up for that...it was hot and sunny, a beautiful afternoon. We only lost by 16 points so we fought well, with the final score being Studley Entaco 88: Brotherhood 104. A meal of sausage, potato and veg, with apple pie and cream to follow was thoroughly enjoyed. Our winning rink was rink 4, and Edna Ward, Tony Howlett, Bill McNeish and Mike Bell got the pens. Sunday 29th April 2018...Studley Entaco home to W.C.C. On a cold and windy Sunday afternoon we took to our green for the first mixed match of the season against WCC. We played 4 triples and a pair, and the green played really well, considering the amount of rain we had during the day before. A very enjoyable afternoon with a very friendly opposition did not help our cause, however, as the final score was SE 78: WCC 90. Our winning rink was rink 5, who beat their opposition by 24 points to 9. Well done to Edna Ward, Elaine Morgan and Phil Cheatham, who were awarded the pens. Traditionally we opened the season with the President versus Captain match. Kelvin welcomed 21 players to the green. Untraditionally the weather was warm and some of us even wore our shorts and crop trousers! Traditionally it rained half way through the game, but untraditionally it stopped after a break for tea and delicious cake, so we carried on! Traditionally the President's team won, 33:21. As the green was heavy (as is traditional at the beginning of the season) we played just 12 ends, enough to get the muscles aching but active. A most enjoyable start to the season. Well done to Phil and the greensmen for getting the green ready in time, and a big thank you to all those who have worked SO hard throughout the autumn and winter to tidy and improve the club facilities. On St. Patrick's Day we played our last indoor game of the season against Welford. For once we made a big improvement, and only lost by 13 points! The match was very enjoyable and Welford players were very welcoming, as usual.Rink 6 was the winning rink with a fantastic score of 21:7, helping our final total to reach Entaco 82: Welford 95, so Pat Kenneth, Peter Holtom and Dave Williams were awarded the pens.Well done everyone, and see you outdoors on the green next month! We tried our luck again on Saturday, this time against Welford, and we did do a bit better, but still lost! We were all glad not to be playing outdoors as the weather was really cold and miserable, but it was lovely and warm inside, and the company was good. It was a very friendly game, played in good spirits, and we enjoyed the afternoon, and the tea and biscuits afterwards. Final score: Entaco 81: Welford 121. Royston Andrews, Sue Birch and Mike Bell won the pens on rink 4. We went for a second thrashing (we must be gluttons for punishment!) when we played our second indoor match again against Bromsgrove. This time we did even worse, with only one winning rink and only half of Bromsgrove's score. But it was an enjoyable afternoon again with good company, and this time both clubs fielded a full 6 rink team (once Duncan arrived!). Final score Studley Entaco 70: Bromsgrove 139. The winning rink was rink 3. Pens were won by Fred Lakin, Sandy Cruickshank, Sue Birch and Clive Berry. Must try harder next time!!! We played the first of our winter season indoor games against Bromsgrove. With some loss of nominees on both sides we played 3 rinks and 3 triples. The company was good, as usual, and the match enjoyable, despite the slaughter! Bromsgrove won, of course; the final score was Studley Entaco 87: Bromsgrove 127. We had 2 winning rinks, but the one with the highest score was rink 1. Congratulations to Maurine Smith, Tony Howlett, Peter Holtom and Mike Osborne who were awarded the pens. It was a gallant but losing fight at the last match of the season at Hewell. The weather was beautiful and the company was friendly but competitive. Their green played very well and the meal afterwards was most enjoyable. We tried hard, but the final score was Entaco 82: Hewell 113. We had 2 winning rinks and both won by 2 shots, so rink 4 and rink 6 both got pens. Well done to Royston Andrews, Lyel Swingler, Mary Salter, Pat Kenneth, Harvey Brereton and Kelvin Rice. The last but one game of the season was played at WCC. The weather was mostly dry, just a short shower didn't spoil the game. We won on 4 out of the five rinks, despite Mike O's attempt to make it look otherwise! The final score was Entaco 84: WCC 77, so a lovely close match overall. Rink 5 claimed the pens this time, which went to Pat Kenneth, Lyel Swingler and Mike Bell. The mid-week match at Crystal was played on a nice, sunny day and on a "challenging" green! But the friendly atmosphere made the game most enjoyable...as did the fact that we won! Final score Entaco 85: Crystal 64. Rink 4 was the highest scoring, and Sue Ginder, Lyel Swingler and Les Husband won the pens. Saturday 9th Sept 2017...Entaco home to F.I.S.S.C. A delayed start due to a thunderstorm marked the start of the match against FISSC at home. We waited for the rain to drain away and then played a very close match on all five rinks. The weather was kind enough to mostly hold off until we finished (thank goodness) and the game was very enjoyable. However we came second overall despite winning on 3 out of 5 rinks. Entaco 71: FISSC 76 was the final score and the pens went to Edna Ward, Sue Birch and Phil Cheatham on rink 4. On Saturday we achieved a glorious win against Redditch on our home green. It was a five triples match and we won on three rinks and lost on two, but with very close scores. The overall result was Entaco 107: Redditch 66. The winning rink was rink 2 with a fantastic score of 34: 7! The pens went to Maurine Smith, Harvey Brereton and Barbara Jeffrey. Well done all! We played Droitwich Spa on their green on Wednesday. It was a five triples match, and a close one at that! The weather was cooler than recently but kind enough not to rain until the very end, and we had an excellent meal to follow. Final score was Entaco 83: Driotwich Spa 72. The pens were awarded to Heather Cheatham, Lyel Swingler and Dave Williams on Rink 4. It was a game of halves at Brotherhood when we played a 5 rink match at their ground on Saturday. The first half was hot and sunny...and we didn't play as well as they did, and the second half was cooler, and we didn't play as well as they did and we ended up with just over half of their score! The green was quick and the lines proved a challenge to us, as did their skillful playing. Eventually we scored 68 to Brotherhood's 123. Our least losing rink was rink 1 with Edna Ward, Harvey Brereton, Peter Holtom and Barbara Jeffrey winning the pens. It was a game of 2 halves (with a storm in a teacup in the middle!) when we played our 5 triples match at Bournville on Saturday. The rain seemed to advantage some rinks but disadvantaged others, (with two of our players sadly falling in the wet...luckily they were ok). Over all we came out on top with Entaco winning 71 shots to Bournville's 65. The winning rink was rink 4, with Fred Lakin, Karen Rice and Dave Williams getting the pens. ​Another cool and dull (but dry) day saw us play a five triples mixed match at FISSC on Saturday. It was a very cheerful game, but an uphill struggle almost from the start. Their green played very well, and so did we...but they played better! In the end we were thoroughly beaten. Final result was Entaco 56: FISSC 95. We did have one winning rink however, and the pens were awarded to Heather Cheatham, Mary Salter and Phil Cheatham on rink 4. We prayed the weather would hold when we took to the green on Saturday against Bournville...and luckily it did. Unfortunately for us, the score didn't! It was a very enjoyable game though, and everyone had a good time.Final score was Entaco 56: Bournville 82. The pens went to Rink 4, the only winning rink. Sandy Cruickshank, Mike Westell and Kelvin Rice were the ones awarded. The weather looked doubtful but held for us when we played a five triples match against Avon at home on Saturday. It was a close match to start with but Avon soon went away and finished the game 21 points ahead. Final score was Entaco 70: Avon 91. Out winning rink was rink 1 and the pens were won by Dave Allman, Peter Holtom and Barbara Jeffrey. It was a very showery afternoon on Saturday when we only managed to play 10 ends at home against Wellesbourne. It was a four triples match...and we won! The tea and cakes were a welcome respite from the rain. Entaco scored 39 points to Wellesbourne's 23, and the winning rink was rink 1. Fred Lakin, Karen Rice and Kelvin Rice took the pens home. We had an overwhelming win when we played Crystal at Entaco on Wednesday. We played a five triples mixed game on a dull but very close afternoon. Luckily the weather held and we managed all 18 ends. Everyone seemed to have enjoyed themselves, despite the one-sided outcome. The final score was Entaco 100: Crystal 54. The winning rink this time was rink 4. Mary Salter, Sue Birch and Bill McNeish got the pens. We played a mid week match against Bidford Seniors It was a lovely afternoon and the atmosphere was very friendly, despite us beating Bidford on all four rinks. Everyone seemed to be in competition for the pens and the results were so close that, once again, I got confused and awarded the pens to the wrong rink. The final score was Entaco 80: Bidford Seniors 42. The pens should have gone to rink 4, so I owe pens to Fred Lakin , Harvey Brereton and Tony Howlett (my mind must have been elsewhere!). But well played everyone! A warm but cloudy (perfect!) afternoon saw us on the green at Redditch Bowls Club. We played a 5 triples mixed match in thoroughly enjoyable company. With a couple of rinks having extreme scores (one each way) it was a very closely fought game, but in the end we came second with the final score Entaco: 62 to Redditch 69. Our winning rink was rink 3 with Sandy Cruickshank, Peter Holtom and Barbara Jeffrey winning the pens. What a difference in the weather (thank goodness) when we had our Gala Day today! A lovely warm and sunny afternoon saw 24 of us take to our green. We started with the traditional spider, and then played 4 games of 5 ends, changing team members after each 5 ends. It was a most enjoyable afternoon with Mike Bell scoring the highest number of shots for (and the fewest against) and so winning the President's Cup. The tea and cake were delicious too! Grateful thanks goes to George Kenneth who organised the whole event and even baked cakes! We played a 4 triples match against Bromsgrove Town on their rink. It was a drizzly day and not very warm, but the match was enjoyable. However the weather did us no favours as far as the bowls were concerned, with Entaco scoring 57 to Bromsgrove's 73. Our winning rink was rink 5, with Mike Bell, Elaine Morgan and Dave Williams getting the pens. It was on a gloriously hot and sunny afternoon (for a change) that we played a 6 triples match against Hewell on our own green. Despite providing squash throughout the match, there was more beer and cold drinks consumed with the cake after the match than the traditional tea! Nevertheless it was a good afternoon, although on this occasion we came second, with the final score Entaco 92: Hewell 105. Our winning rink was rink 6 with Maurine Smith, Karen Rice and Peter Holtom receiving the pens. Saturday 10th June 2017... Entaco home to Stratford. We played a 5 rinks match (for a change) against Stratford - on -Avon. The weather was showery but the company was good...and we achieved another win! With an overall total of Entaco's 114 to Stratford's 69, we won on 4 out of the 5 rinks. Rink 3 won the pens, which went to Karen Rice, Royston Andrews, Lyel Swingler and Kelvin Rice. Wednesday 7th June 2017...Entaco away to Inkberrow. We managed just 14 ends on a cool, showery evening at Inkberrow on Wednesday. The company was good and the game fun despite the weather, and the supper was lovely as usual. Nevertheless we only managed to come second on this occasion, with Inkberrow beating us 43 shots to 24. Rink 3 was the winning rink and Sue Birch, Duncan Scott and Tony Howlett got the pens. It was a pleasant afternoon on Saturday when we played Wellesbourne on our home green. The weather stayed fine and it was reasonably warm, but the green was a bit heavy from the previous day's rain. That seemed to be in our favour, as we won on 3 rinks and drew on the fourth. An enjoyable afternoon overall, with Entaco scoring 79 to Wellesbourne's 36. The winning rink was rink 5, and Mary Salter, Phil Cheatham and Barbara Jeffrey were awarded the pens. Special thanks goes to Phil who saved the day by fixing the urn, so we didn't miss out on our after-match tea! After a few glorious days we took to Kings Heath's "green" on Saturday in cool and blustery weather. But at least it didn't rain! The green had been scarified and damaged and was very "interesting" to play on, but it turned out to favour Entaco rather than Kings Heath. 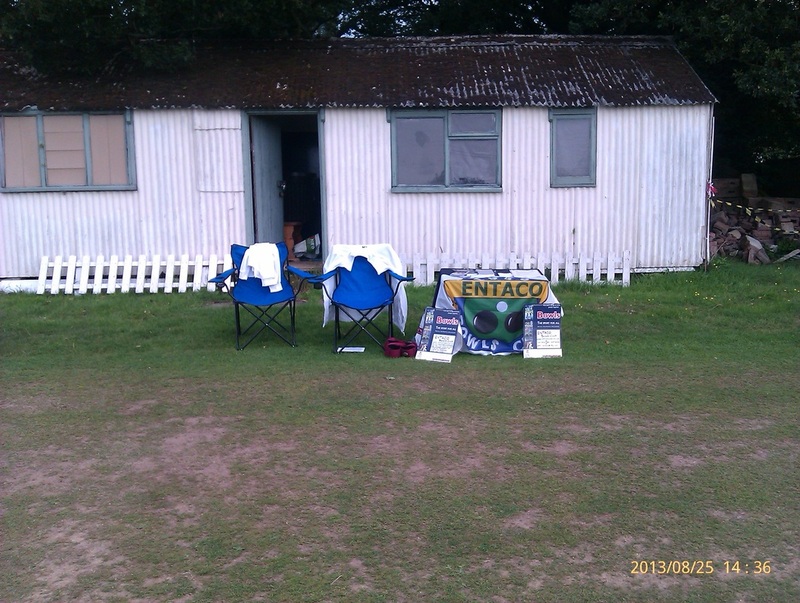 With a final score of Entaco 143:Kings Heath 81 we "stuffed" them for a second week running. But everyone had enjoyed the two matches which had been played harmoniously. Congratulations to all who played. Sue Ginder, Phil Cheatham and Mike Westell were awarded the pens on rink 1. In cool, showery weather, we took to our home green with a match against Kings Heath Bowling Club. Although the match was booked as a 5 triples match, both clubs managed to field 6 triples, so everyone who wanted a game was able to play. Entaco won on 5 out of the 6 rinks, but the losing rink only lost by 2 points, so a terrific effort and result from everyone. Final score: Entaco 112: Kings Heath 69. The winning rink was rink 3. Well done to Sue Ginder, Mike Westell and Dave Williams. It was a game of 2 halves with tea in the middle when we played a 5 triples match at Welford. The weather was kind to us and the company very welcoming. At half time the scores were pretty even on most rinks, but the second half made all the difference. With 2 of our triples winning comfortably (but the other 3 losing) the final score was almost a dead heat with Entaco on 90 and Welford on 94. The winning rink was rink 1 and the winning players (who are owed pens) were Fred Lakin, Lyel Swingler and Barbara Jeffrey. We played a chilly 5 triples match at home against Brotherhood. The weather threatened us throughout but managed to stay dry and we all had a good time apart from the cold, so the mid match tea break was very welcome (thanks Dave and Terry!). I had hoped the second half might be a little warmer but sadly no such luck! Brotherhood defeated us by an even greater margin than last year, with the final score of Entaco 76 : Brotherhood 106. 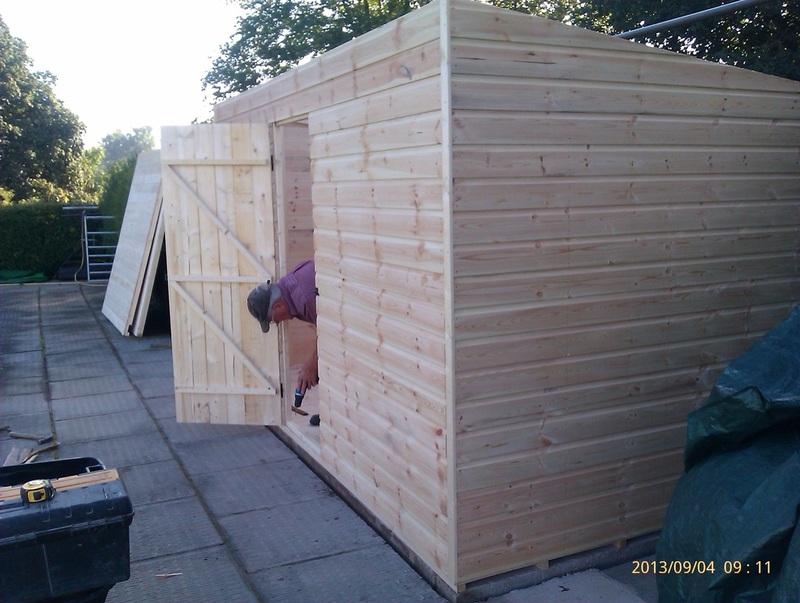 Rink 3 got the pens, so well done to Royston Andrews, Sue Birch and Mike Bell. A 5 mixed triples match was played at home against WCC. Entaco were the victors, winning on 4 out of the five rinks with the final score of Entaco 100 : WCC 63. Rink 1 was the highest scoring, and the pens went to Lyel Swingler, Harvey Brereton and Mike Osborne. It was good to see many 'familar ' faces and we look forward to the return match later in the season. The season opened with the annual President versus Captain match. 24 members signed up for the game so the match was played on a 3 rinks basis. The green was not as heavy as in previous years but we all still struggled to reach the long jacks after the ease of the indoor rinks! A good afternoon was enjoyed by all however, and the President's team beat the Captain's (as usual!!) by 73 shots to 57. We received the usual warm welcome and, due to low numbers on both sides, borrowed a couple of Welford's players to make up a 3 triples and 2 rinks game. Many thanks to John Tester and John Reynolds for their help, and to Roger Cooke for bearing with me with our constantly fluctuating numbers. The game was enjoyed by all and Welford won in the end, but only by 11 points. Final score, Entaco 79: Welford 90. The winning rink was rink 1 and the pens were given to Brian Peberdy, Sue Birch and Clive Berry. Another successful result was achieved when we played the West Midlands Police at Billesley. We ended up with a match of 5 triples and a pair (thanks to Dave Williams who volunteered and played all too well for the opposition!) so that everyone who turned up could play. WM Police initially went ahead, but we soon caught them with an arresting performance!! Final result was Entaco 89: WM Police 73. The pens went to Eileen Brereton, Tony Howlett and Kelvin Rice on rink 1. We played another successful match on Bromsgrove's Indoor venue. We put out a 5 rink team and took an early lead, which we managed to maintain throughout the game. It was a very enjoyable afternoon for all, and the tea, biscuits and cakes were very much appreciated. Final score was Entaco 97: Bromsgrove 84. The winning rink was rink 2 and so Fred Lakin, Bob Perks, Phil Cheatham and Barbara Jeffrey earned the pens. Thanks to everyone for turning out. We played a well fought match at Welford. As I was medically unfit to play it was most interesting to watch from the sidelines...and I never played a bad bowl at any time during the game! Entaco took the first end on all 6 rinks, and were soon about 20 shots up, but Welford started to come back at us and it was touch and go whether or not we could hold on. In the end both teams had won on 2 rinks, drawn on 2 rinks and lost on 2 rinks. Whilst Welford would have liked to declare a draw, Entaco won by 104 shots to Welfords 92. The highest scoring rink was rink 6 but the winning rink by shot difference was rink 3, and the NEW pens went to Pat Kenneth, Graham Timmins, Peter Holtom and Mike Bell. We played the first of our indoor matches of the winter season against Solihull. In the event both teams could only raise 5 triples, but that proved to be enough for a fun filled afternoon. Solihull soon went into the lead and after the first few ends were 15 points ahead; however we hung on and finished the game no worse off. Final score was Entaco 66: Solihull 81. Our winning rink was rink 4, and the pens went to Terry Birch, Phil Cheatham and Mike Varnham. Well done everyone. Today we played our last friendly game of the season against Hewell on their green. The weather was dry and not too cool and it was a well fought match on both sides, played on a lovely green (well done Jim and Eddie). Hewell were in the lead at half time but Entaco were the victors by just 3 points when the game finished. Both teams had wins on 3 rinks, but Entaco won all the raffle prizes! Final score Entaco 96: Hewell 93. The winning rink was rink 6 and pens were given to Karen Rice, Bill McNeish and Barbara Jeffrey. On an overcast but dry Saturday afternoon Entaco players enjoyed a very friendly 5 triples match against WCC on their green. Entaco won by 91 to 56 shots with our winning rink being Karen Rice, Dave Williams and Les Husband, scoring 25 -7. Our other rinks results where:- Mike Bell 15 -16, Barbara Jeffrey 11-12, Mike Osborne 21-9 and Kelvin Rice 19-12. The match halted after nine ends for tea and biscuits and after 18 ends we sat down to an excellent spread of open sandwiches and pork pie followed by a mousse desert and jam doughnut! A great afternoon all round! Today found us giving a "right good thrashing" to Crystal on their home green. It was a very hot afternoon for September and we all appreciated the break and refreshments half way through the game. Entaco won on all rinks with the final score of 106 to Crystal's 50. This time I correctly identified the winning rink as Rink 2 (with a shot difference of 17) and gave the pens and congratulations to Fred Lakin and Karen and Kelvin Rice. But well done everyone who played, and we send our best wishes to Les (who damaged his eye in the morning before the game), and hope he recovers quickly. Only 2 more games to go folks! After a very wet and unpromising start to the day, we managed to play a mostly dry game at FISSC. It was a very closely fought game, resulting in a draw of 86 points each to Entaco and FISSC. Unfortunately I wrongly allocated the winning rink pens to Rink 3 (who had the highest score) instead of Rink 6 (who had the least shots against and therefore the best score difference). So the pens went to Maurine Smith, Harvey Brereton and Kelvin Rice, and my apologies (and bags of sweets!) have been given to the true winners, Terry Birch, Karen Rice and Dave Williams! ​After three cancelled matches on the trot we finally managed to play a game at Brotherhood. The weather threatened to be unkind but we only came off for a short sharp shower, and then we played on as the weather improved. This is a game we traditionally lose...but not today! Both teams won on 3 rinks, but the final score was Entaco 96: Brotherhood 84. The pens and congratulations went to Maurine Smith, Harvey Brereton and Les Husband on rink 3. Well done everyone!! On a lovely hot summer afternoon six mixed triples took to the green at Bournville. Everyone enjoyed the weather and the match, as the company was good and the conversation flowed. Sadly the bowls didn't flow as smoothly for us, and Entaco lost 79:114. The winning rink (by only 1 point) was rink 3. Congratulations to Eddie Woods, Sue Birch and Ann Janes. In one of the closest fought games I've ever played in we enjoyed a very pleasant afternoon on Saturday against Wellesbourne on their green. Four mixed triples battled it out with the final scores on each rink as follows; 10:11, 16:16, 16:15, and 16:10. So Entaco won by just 6 points! 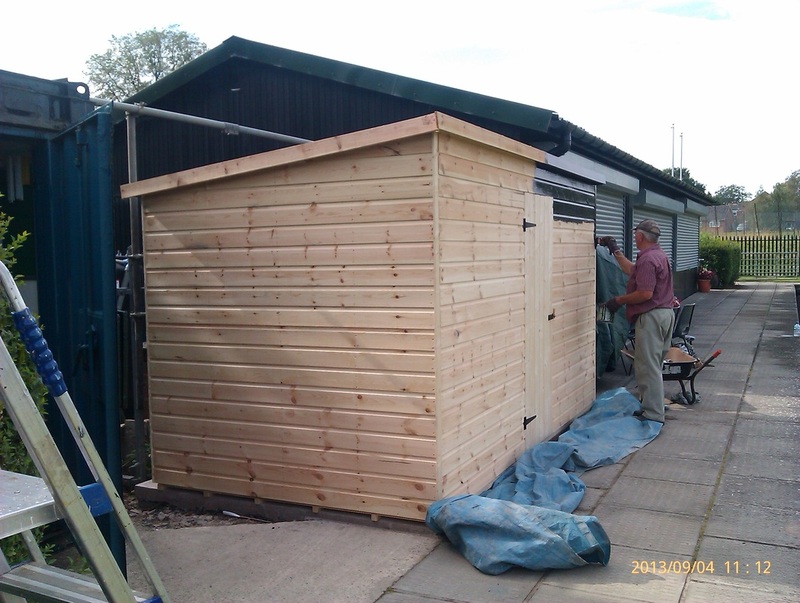 Well done to rink 4, (Pat Kenneth, Harvey Brereton and Dave Williams!) who made all the difference and won the pens! We played St Barbara's at home today on a pleasantly warm and dry afternoon. The company was great, and the match was played in a very friendly atmosphere. Everyone enjoyed themselves and we had a lovely meal together afterwards. The final score made it an even more pleasant afternoon for us, as Entaco won 115 to St. Barbara's 77. Our winning rink was rink 6, and the pens were awarded to Brian Peberdy, Eddie Woods, Tony Howlett and Barbara Jeffrey. Wednesday 13th July 2016...Entaco v Bidford Seniors ...away. It was a hard fought match on a much improved green, and the weather was kind to us. However, it wasn't our day for luck, and the final score was Entaco 74: Bromsgrove Town 99. Our winning rink of the day was rink 2. Congratulations to Eddie Woods, Duncan Scott and Dave Williams. Thursday 23rd June 2016... Entaco v Welford... away. We played 4 rinks, instead of 6 as neither club could get 6 rinks, a lot of people were on holiday. We started play being surrounded by huge black clouds with thunder and lightening in the distance. We managed to get to 17 ends before the heavens opened and everyone dashed for cover. It did not let up so we abandoned the match at 17 ends. We were well and truly beaten, Entaco 44 and Welford 81 but it was an interesting and eventful game. Rink 3 was our winning rink so Duncan, Harvey, Bob and Barbara had pens. We will not be playing Welford again until January next year indoors so it was apt to wish everyone a merry Christmas!!!!! ​Saturday 18th June 2016... Entaco v Hewell ...home. We played 5 triples and for once we had too many members wanting to play so had to rest 4 which we hate doing but Hewell could not get any more players. It was nip and tuck all the way through for all rinks with the final result being 83 to Entaco and 99 to Hewell. The winning rink was rink 1 with Sue G, Lyel and Stan receiving pens. It was an enjoyable game in good company with fine weather, can't ask for much more. We had a very closely fought game against Stratford-on-Avon Bowls Club on Saturday. The rain held off and we were able to play all 18 ends, which didn't look very likely during the morning. 3 of the 5 rinks scored so closely, and the other two were opposites to each other so it was hard to know exactly what had happened until both captains added it up twice! In the end Entaco won by just 2 points. Final score Entaco 82: Stratford 80. Congratulations to Maurine Smith, Duncan Scott and Mike Bell on rink 5, for our winning rink, who won the pens. On Saturday we played 4 triples against Wellesbourne on our green. It was a hard fought game with both teams winning two rinks each. In the end however, Wellesbourne just pipped us at the post with the final score Entaco 64: Wellesbourne 68. Our winning rink was rink 4, with Eddie Woods, Tony Howlett and Stan Yarnold winning the pens. Weather was brilliant and so was the game, atmosphere was lovely, mind you we knew most of them from indoors so the banter was great. We lost 74-91 but it didn't feel like it because it was so enjoyable and that's what it is always about. With Heather at the helm we fielded 4 triples and one pair (by mutual consent) against Kings Heath at home. It was a lovely warm afternoon and a good time was had by all. Luck was on our side too, and we won the match with a final score of Entaco 98: Kings Heath 56. The pens were won by Karen and Kelvin Rice who played as the pair. Congratulations to all! We played the first of our 2 matches against Kings Heath at their home green on Saturday. The rain held off until almost the end of the match, thank goodness, and my thanks go to everyone who turned out when so many others were unavailable. It was a very exciting game, and the final result couldn't have been closer, with Entaco scoring 77 and Kings Heath 76! Our highest scoring winning rink was Rink 5, and the pens were awarded to Pat Kenneth, Phil Cheatham and Dave Williams. We managed our first win of the season on Saturday against Welford. On a lovely sunny afternoon we played a five rink mixed game, and the final score was Entaco 89: Welford 76. One of Welford's players, Phil, was sadly taken ill after only 2 ends. We all wish him a speedy recovery and hope to see him at our return game later in the season. Our winning rink was rink 4. The pens went to Fred Lakin, Bill McNeish, Sue Birch and Barbara Jeffrey. Saturday 7th May 2016...Entaco v Brotherhood. Saw us playing a 5 rink mixed match against Brotherhood at home. We kept our fingers crossed for the weather, which threatened thunder, and for a better score than the last time we met. And we were lucky on both counts as the rain held off until we came in for tea, and there were only 17 points between us, rather than the 64 last time! The final score was Entaco 81: Brotherhood 98. Rink 4 won the pens. Congratulations to Pat Kenneth, Kath Lapsley, Phil Cheatham and Kelvin Rice. Monday 2nd May 2016... Entaco win Redditch Triples league match against Hewell to go top of the second division after two games. Same start as last year...let's hope for a better run to the end of the season than last! Sunday 1st May 2016...Entaco v W.C.C. Had a fun filled match against W.C.C. We fielded 5 mixed triples and had a very enjoyable afternoon, (the weather was relatively kind). Unfortunately we suffered a substantial loss with W.C.C. winning 90 to Entaco's 62. We did have one winning rink though, rink 6, and the pens went to Royston Andrews, Sue Birch and Karen Rice. Saturday 23rd April 2016...We opened the 2016 outdoor season with the traditional President v Captain match. The weather was cold but fine and 24 players enjoyed the afternoon. Also true to tradition, the president's team won 77:58. Karen Lumley, the local MP for Redditch also joined us and "had a go" herself. We all enjoyed tea and cakes at the end (thanks to all those who did the baking). A big thanks goes to Karen and Kelvin Rice who did loads of work making the grounds look really tidy, and for mowing the car park!! We played the final​ indoor match of the season against Welford. A most enjoyable game, which seemed to be very close at the beginning with level scores after 6 ends. However shortly afterwards Welford were well in the lead, so it was a welcome surprise when I added up the final score to discover Entaco had won by one point! Thanks to Mike and Joan Bell for playing for us, and to Brian Hadley and Brenda Henry for stepping in at short notice. Final score; Entaco 119: Welford 118. The winning rink was rink 1. Congratulations to Maurine Smith, Brian Peberdy, Bill McNeish and Kelvin Rice. Another very enjoyable game was played against West Midland's Police at Billesley (on a BLUE green)! The facilities were excellent in the almost new building, and the opposition provided a warm welcome and a great game for all. We played 6 triples, but were soundly beaten with the final score Entaco 91: MWPolice 113. We did have a winning rink though, which was rink 4. Congratulations to Duncan Scott, Sue Birch and Mike Varnam. We suffered another glorious defeat when we played Bromsgrove's indoor team. With many of our players unwell (get well soon, folks) we managed to field a team with help from 3 players from Bromsgrove, 1 past Entaco member, our own treasurer who doesn't normally play in matches and a couple of "sickies" who struggled through the pain and played anyway...I'm very grateful to you all. An enjoyable afternoon despite the final score, which was Entaco 58: Bromsgrove 123. We had ONE winning rink though, rink 3, so well done to Fred Lakin, Jan Bryan, Lyel Swingler and Barbara Jeffrey. We played the first of our two winter games against Welford's Indoor team. As usual it was a hard fought game with much enjoyment and laughter on both sides. At half time's tea and biscuits it was obvious which way the game was going (sadly not in our favour) and the second half unfortunately continued in the same direction. At end of play the scores were Entaco 90: Welford 124. We did have a winning rink though, which was rink 4. So congratulations to Maurine Smith, Brian Hadley, Sue Birch and Kelvin Rice who each earned an Entaco pen and a commemorative coaster from Welford (their 75th anniversary year). Thanks again to Mike and Joan Bell and Brenda Henry for helping to make up the numbers. Sunday 15th Nov 2015...Entaco v Solihull. We played a competitive but fun match against Solihull Indoor Club. We managed to field a full 6 rink mixed team by adding a few "ringers" (thanks to Mike and Joan Bell, Chris and Ronnie Jenkins, and Brenda Henry). Thanks also to Brian Hadley who was our reserve but stood in for one of Solihull's players who was taken ill part way through the game. We looked as if we might hold our own with only 3 points between teams at half time, but sadly the second half didn't go in our favour and Solihull won by 22 points in the end. Final score was Entaco 99: Solihull 121. Our winning rink was rink 3. Congratulations to Veronica Jenkins, Royston Andreews, Lyel Swingler and Les Husband. Saturday 10th October 2015... Entaco v West Midlands Police. ​Started off this season's indoor matches. We played a 6 rink mixed match against West Midlands Police at Bromsgrove. Both teams fielded "ringers" and it was good to meet up with a lot of familiar faces. Everyone enjoyed the afternoon and both teams won 3 rinks each. However the final score was Entaco 99 West Mids Police 132, so they won again! Thanks go to Mike and Joan Bell and Gerald Goodman who played for us, and to Geoff who went and got the muffins and doughnuts! Our winning rink was rink 3, and the pens went to Joan Bell, Dave Allman, Sue Birch and Dave Williams (again!!!). ​It couldn't have been a more perfect afternoon for the last friendly game of the season against Hewell. The weather was perfect, their green was flawless, the company was great and the food delicious. The scores were very close too, with Hewell just pipping us 101 to 96. If only they hadn't got 7 on the last end...! Our winning rink was rink 3 with pens going to Terry and Sue Birch and Dave Williams (again!!!!). Many thanks to Veronica and Chris Jenkins, the "ringers" who made up our numbers. As you know I am standing down as captain. I hope that whoever takes the job will enjoy it as much as I have done. Thank you all for your help and support over the last two years, and good luck to us all next season. On Friday 11.09.15 we welcomed a touring team "Somerton" from Somerset. In perfect weather we played 6 mixed rinks and thoroughly enjoyed the company and the game. We were all presented with a diary for 2016, and presented them with pens and a framed club badge as a memento of the occasion. The final score was Entaco 137: Somerset 98 so Entaco won overall. Two rinks each scored 30 points but taking into account shots against the winning rink was rink 5, and the pens were presented to Heather Cheatham, Tony Howlett, Peter Holtom and Les Husband. Our second match of the busiest week of the season was played at Crystal on Wednesday 09.09 15. We took 4 mixed triples and had a pleasant afternoon in very good company, on a very challenging green! The half time delicious refreshments came as a welcome break to the struggle everyone was experiencing but it was a very close result in the end with Crystal just pipping us by 6 points. Final score: Entaco 67, Crystal 73. The winning rink was rink 2, and the pens went to Tony Howlett, Lyel Swingler and Barbara Jeffrey. We had a most enjoyable evening on Tuesday 08.09.15 when we took 5 mixed rinks to play at Droitwich Spa. The evening was cool but pleasant and it was an interesting experience for many players who hadn't previously played under flood lights. Sadly luck wasn't on our side, and Entaco lost 88 to Droitwich Spa's 110. But we did have a couple of winning rinks and the highest scoring was rink 2. Congratulations to Heather Cheatham, Bob Perks, Phil Cheatham and Dave Williams. The weather was just perfect for the 5 mixed triples match on Saturday 29.08.15, not too hot or windy but lovely and sunny, when we played Redditch at home. Nobody ran away with the score which made for a very enjoyable game on all rinks, with Entaco coming out on top overall. The final score was Entaco 92, Redditch 82, and the winning rink was rink 5. Maurine Smith, Harvey Brereton and Kelvin Rice won the pens. Only a few matches left now folks, so keep up the good work! We took a right good pasting from Brotherhood on Saturday 22.08.15 on their home green. Playing 5 mixed rinks to their (almost) all men team we were very lucky with the rain which held off right until the end of the game. Entaco lost on all rinks, with the final score Entaco 69: Brotherhood 133. The rink with the least difference in score was Rink 5; Entaco 16 to Brotherhood's 24, so the pens went to Maurine Smith, Royston Andrews, Harvey Brereton and Dave Williams. On Saturday 08.08.15 we hosted the return match against Ross-on-Wye. Last year we visited their ground, so it was our turn to do the honours. The weather was lovely, which got everyone in the right mood for a very enjoyable afternoon, and a very close match. We each won on 3 rinks and with only 5 points between us we were pleased to discover that Entaco won 126:121. Our highest scoring winning rink was rink 6. Congratulations to Maurine Smith, Bill McNeish, Peter Holtom and Dave Williams. A showery start at the beginning of the game at Bournville didn't put us off, thank goodness. We played 4 rinks and 2 triples after borrowing players from other clubs to make up the team. Many thanks to Brian Thorpe and Dave Inions from Kings Heath and Veronica and Chris Jenkins from West Midlands Police. We all had a good time with tea after nine ends, which gave the sun chance to come out again. The final score was Entaco 117: Bournville 82. There were 2 winning rinks with the same score difference of 11 points, so the pens went to rinks 2 and 6, and congratulations to Veronica Jenkins, Sue Birch, Lyel Swingler Barbara Jeffrey, Edna Ward, Eunice Freeman, Phil Cheatham and Chris Jenkins. We were lucky with the weather on Saturday 25th July, as it had rained almost non stop the day before, so everyone was pleased it was dry when we played the 4 mixed triples game at home against Avon. A most enjoyable match resulted in both teams winning 2 rinks each, but the overall score was in our favour; Entaco 74: Avon 55. The winning rink was rink 4, so the pens went to Sue Birch, Phil Cheatham and Kelvin Rice. 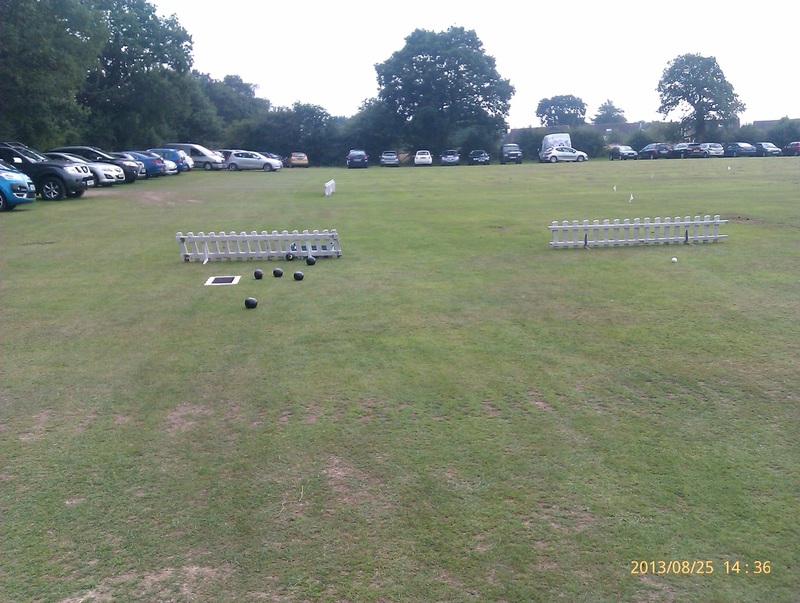 On Wednesday 15.07.15 we played a 4 x mixed triples game v Crystal on our home ground. The weather was almost perfect...a brief shower and then not too hot. Our green played very well and we had many compliments about its condition, so congratulation to the grounds team. We all enjoyed the game and played well but just lost over all, with the final score Entaco 62:Crystal 72. The winning rink was rink 4. Congratulations to Fred Lakin, Bill McNeish and Barbara Jefferey. Fortune turned in our favour on Saturday 11.07.15 when we played St. Barbara's on their home turf. A warm and cloudy afternoon found us battling with the running of their "green", which was described as "challenging"! Much excitement was caused when any bowl ended up near the jack, but the game was full of laughter and good cheer. In the end Entaco triumphed, scoring 83 to St. Barbara's 53. Winning rink was rink 4. Congratulations and the pens went to Royston Andrews, Bill McNeish, Phil Cheatham and Ann Janes. We took a bit of a thrashing from Bidford Seniors on Wednesday 8th July. Their green played really well and the weather was perfect for a lovely afternoon's game, but in the event it didn't help us much! We all enjoyed the game though, which was played in really good spirits. Final result was Entaco 57: Bidford Seniors 82. We did have one winning rink though, rink 5, and congratulations (and the pens) went to Pat Kenneth, Royston Andrews and Harvey Brereton. We were playing Welford at home Captained by Heather, but the match did have a bad start. We were all in and out of the club house like Yoyos as we had several heavy downpours in the first hour. However, after that the sun came out we all had a most enjoyable game which we always do with Welford. The final result was 103 - 80 to Entaco. The ladies played Bidford ladies at home and were the winners 57 shots to 34. On the beautifully sunny evening of Thursday 4th June we played a mixed 5 triples match against Inkberrow on their green. The green played very well and the game was played in good spirits. Each team won on 2 rinks and drew on one, but the final score went in our favour with Entaco scoring 81 to Inkberrow's 71. The winning rink was rink 5. Congratulations to Fred Lakin, Sue Birch and Kelvin Rice. On Thursday 28 May 2015 we played Bromsgrove Town at home. It was a 5 mixed triples match and the weather was dry, but with a cold wind. Our green played exceptionally well, and our "Green Team" received many compliments from the opposition. Entaco won on 4 of the 5 rinks, and we won the match overall with a final score of Entaco 85: Bromsgrove Town 67. Our winning highest scoring rink was Rink 5. Congratulations to Fred Lakin, Lyel Swingler and Barbara Jeffrey. Saturday 23rd May 2015 saw the return match with Kings Heath on their green. It was a sunny, reasonable afternoon, and very pleasant company. We didn't do so well this time though, winning only 2 out of the 6 rinks, after winning all 6 on our own green last week. Final score was Entaco 92: Kings Heath 103. Winning highest scoring rink for Entaco was rink 1. Congratulations to Wyn Richards, Harvey Brereton and Mike Osborne who won the pens. It was a pleasure to welcome Kings Heath to Entaco. Weather was fine but windy. We all had a pleasant, friendly afternoon and the icing on the cake was Entaco won every rink! Final score was 120 - 77. Our winning rink was Royston Andrews, Bob Perks and Mike Osbourne with an astounding 28 - 2. On Saturday 2nd May we played a mixed home game against Brotherhood. The green played well and the weather was kind but cold. Sadly the match was very one-sided, unfortunately not in our favour! However we all enjoyed ourselves, which is the most important thing. The final score was Entaco 49 : Brotherhood 133. Our highest scoring losing rink was rink 5; congratulations to Pat Kenneth, Bill McNeish, Lyel Swingler and Barbara Jeffrey who won the pens. On Saturday 26th April we played our first mixed triples of the season against W.C.C. The weather was great, if a little cool, and defied the forecast earlier in the week when it looked as if the game may even be rained off! It was a game of two halves, with a nice cup of tea in the middle, and the scores remained close throughout. In the end we lost by just 5 points: Entaco 66 to W.C.C. 's 71. Our winning rink was rink 6. Congratulations to Tony Howlett, Terry Birch and Barbara Jeffrey. Edna, Kelvin and Margaret Andrew picked up 7 shots on the last end and Terry, Sue and Karen picked up 5 shots on their last end resulting in a 68 - 67 win for Entaco. The outdoor season opened in glorious, if cool, weather with the usual President versus Captain's match. 33 members took to the green for a fun game to reacquaint their muscles with the effort necessary to get the bowls to reach the other end, after playing the much lighter game indoors during the winter months. It was a very close match, enjoyed by all, and the Captain's team won by just 5 points. The game was followed by tea and cake, and much conversation and laughter. This week will see the beginning of the roll ups on Tuesday afternoon and Thursday evening, the Ladies' beginning of season roll up on Wedneday afternoon, the first Ladies' friendly game on Saturday afternoon versus Stratford Town and the first of the Mixed friendly matches on Sunday versus W.C.C. Look forward to seeing you all then. We were not able to field as strong a team as usual due to illness and other commitments, but did manage the full 6 rinks. The match was rather one sided from the start, with Welford winning on all 6 rinks during the early game. 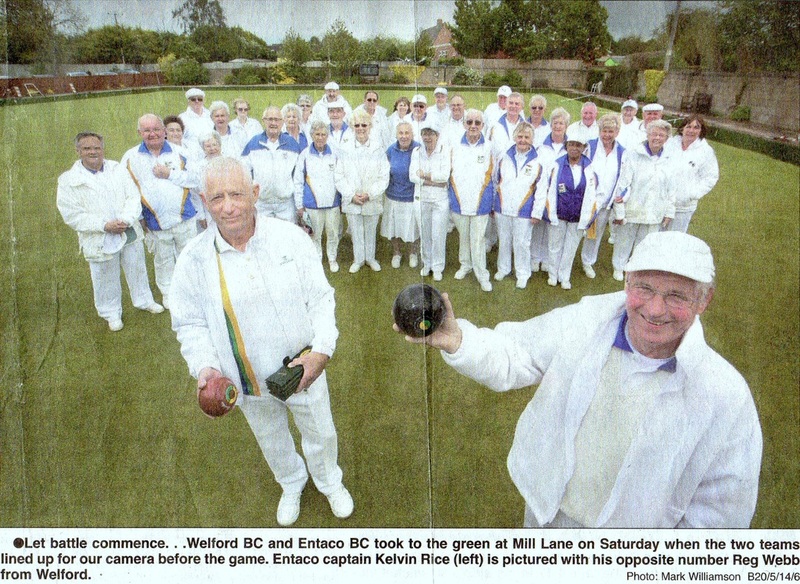 Entaco did manage to win on 2 rinks by the end of the game though, and the final score was Entaco 99: Welford 146. We were made very welcome as usual and the game was played in good spirit. Congratulations to the players on our winning rink, rink 6. They were Terry Birch, Bob Perks, Judy Warner and Mike Bell. My thanks to those who were under the weather but turned out anyway...you know who you are! Our fourth indoor match at Bromsgrove on Valentines day was a victorious one! The final score: Entaco 116, Bromsgrove 98. A closely fought match all the way through...Bromsgrove almost drew level at one point, but Entaco managed to pull ahead again. Entaco top rink was on Rink 6, with a final score of 34 to 12, well done to Maurine Smith, Bob Perks, Judy Warner and Mike Bell. The next match is on 21 March 2015 at Welford, if you haven't played recently and would like to play, please let Sue Birch know as soon as you can. Our third indoor match at Welford and first of 2015 saw a game played in the best of spirts. However, Entaco came out on the losing side by a score of 95 - 112. The winning rink for Entaco contained Heather Cheatham, Peter Holtom, Kelvin Rice and Les Husband. Our second indoor match at Solihull was a game of two halves. Solihull streaked into the lead and Entaco fought back strongly in the second half. However, the comeback was not quite achieved with the score 92 to 79 in favour of the hosts. There were two winning rinks with the honours going to, Pat Kenneth, Bob Perks, Peter Holtom and Barbara Jefferey. The other rink contained Terry Birch, Harvey Brereton, Judy Warner and Mike Bell. Our first indoor match against West Midlands Police was a very friendly game, although Entaco lost 103 to 108 in a closely fought battle. Our winning rink was Fred Lakin, Heather Cheatham, Phil Cheatham and Mike Osbourne. 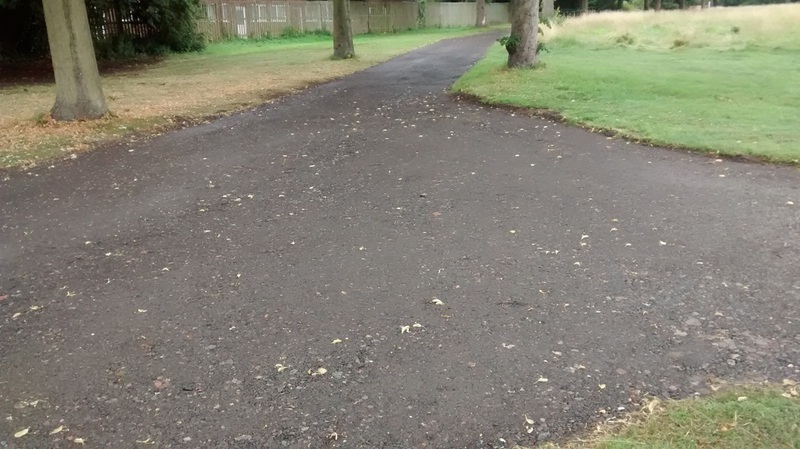 Tuesday 29th/ Wednesday 30th July...At last the weather has been dry for a sufficiently long enough spell to allow the ground to dry out on the drive and surrounding areas. 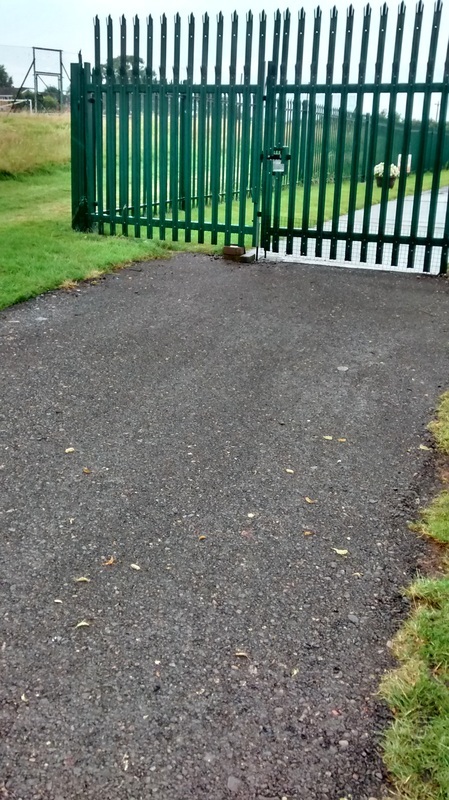 This has allowed us to go ahead with the long awaited resurfacing of the drive, from top to bottom plus the area by the gate made larger. This was paid for out of club funds so please take care when driving up and down the drive...no drag racing or wheelies! 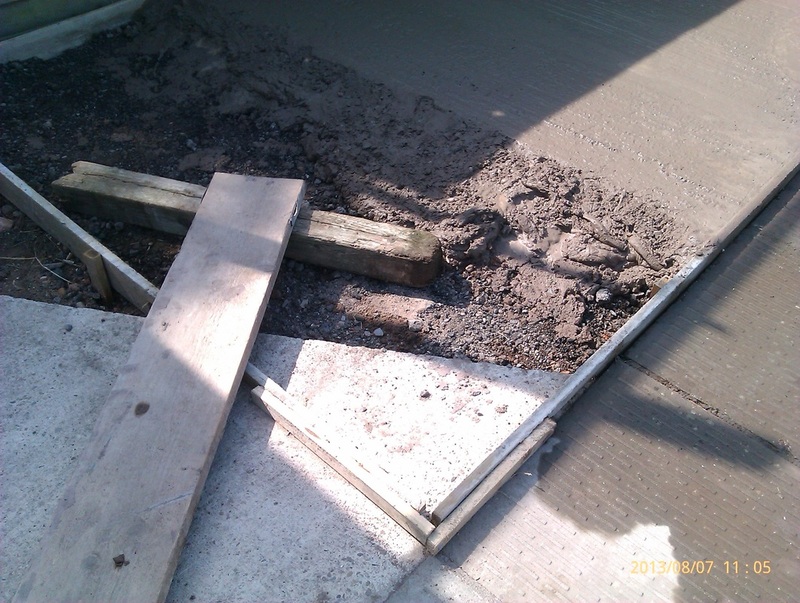 If you spot any damage please report it, to any committee member, as soon as it is noticed. Sunday 27th July...Another hot and sunny summers week that started with a good Redditch Triples league win at home to Hewell B by 80 shots to 55, picking up 12 points. This took us back to the top of Division 2 by just one point! However on Tuesday the Interberga team came up against a strong Barbourne side, at home, losing 2 rinks to one, and picking up just 2 points from a possible 12.. Wednesday saw our Ladies fortunes turnaround with a 48 to 33 shots win at home to Inkberrow. Also on Wednesday evening Gerald, Darren and Mike Bell played a South Warks triples competition match...losing 13 shots to 12! Thursday evening and 14 members took part in CPR and AED awareness training run by paramedic Neil Perks and his wife Tracey. We now all have a much better feel for what to do if a person goes into cardiac arrest and can hopefully do something positive if needed. We have our own AED (Automatic External Defibrillator) generously donated by a member. To round off the week our home friendly against Avon gave us an 82 to 48 shots overall win. 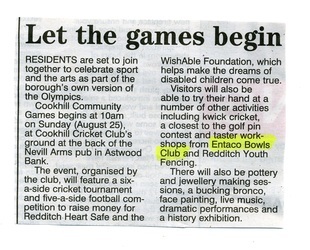 Sunday 20th July... Another busy bowling week with a full hand of wins for Entaco. The Saturday match against St Barbara's gave us a 99 to 70 shots win, 4 rinks to one. Monday saw a good result for the Redditch Triples league team taking 10 points to 4 points with a narrow , 3 shots, win at Barbourne. This was followed by the Interberga team picking up 11 points from 12 at Inkberrow on Tuesday evening. On Wednesday we played a friendly against Crystal and again came out winners by 73 shots to 60. On Friday the County men's singles quarter finals were held on our green with many of the familiar top players taking part. However the Saturday match at Wellesbourne was called off due to heavy rain, thunder and lightning that lasted most of the early hours of Friday morning and well into Saturday. If we can this match will be re arranged for later in the season. Finally, on Sunday, three of our ladies took part in the Bidford Gala. Karen Rice, Barbara Jeffrey, Maureen Smith together with Hewell member Steph Greenwell had an excellent overall win taking first prize. Well done. Friday 11th July... A very dry week to date both weather wise and for results! The week started with a closely contested match away at Redditch B.C. The result went their way 97 shots to 71, winning 4 rinks to 1. This was followed on Monday by our exit from the Spencer Cup when we were well beaten by Hewell A by 93 to 53 shots. The Tuesday Interberga team managed to restore the faith by gaining an 8 points to 4 win at Droitwich. The friendly match at Bidford saw Entaco win all 4 rinks for a total of 71 shots against 45 for Bidford. Numbers of members played the next round of their club competition matches with some very close results and some surprise winners moving forward to the next round. Well done to all who took part. Friday 4th July...A week of rain, sunshine and mixed fortunes. Saturday's match against Stourport was eventually rained off despite the away team travelling to Entaco in the hope of playing..just too much surface water spoiled the day. We did have tea and buffet but no one seemed keen to play once the water went away. Our Redditch triples league team did the return trip to Stourport on Monday where we were well beaten by 80 shots to 63, picking up only 2 points from one winning rink. But a game played in the right spirit with a drink or two afterwards. Results picked up on Thursday when the men played at Bidford, winning 75 to 63 shots, and a tasty ploughmans afterwards. Thursday also saw SW ladies versus SW men played on our green. All went well with a number of Entaco players, men and ladies, taking part. Jun 2014...Congratulations to our ladies team of Karen, Judy, Helen & Margaret for winning the South Warks Ladies Gala. See photo of plaque below. 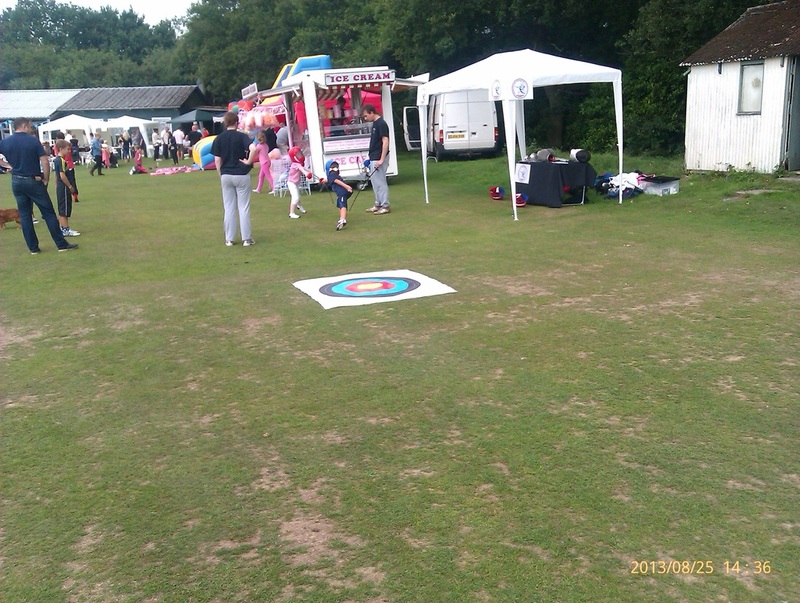 Monday 22nd June... Have reluctantly decided to cancel our Gala Day, due on Sunday 29th June as, despite several notices being posted, the number of entrants this year is too low to hold 'round robin' matches. Tuesday 23rd June...﻿A week of gloriously hot weather and ti﻿me to catch up on the latest round of match results for Entaco. A narrow win of 106 to 97 shots against Hewell in the Saturday friendly held on Saturday 14th June was followed by a good win against Welford on the following Saturday, 21st June, by 128 to 79 shots from four winning rinks, one drawn and one loosing rink. On Monday the Redditch Triples league team won three of the four rinks at Droitwich to beat the 'Blue' team by 74 shots to 59 and pick up 12 points. This was followed on Tuesday by the Interberga team winning all three rinks against Charford by 59 to 31 shots and also earning 12 points. Tuesday 16th June... A narrow win, by just one point, for our Redditch Triples league team over Hewell A despite us losing 2 of the 4 games and drawing the last game to finish...nail biting stuff right down to the last wood! A great match played in the right spirit. Friday 13th June ...While the weather has been more settled this week the results have been a bit up and down! Started well with a win at Inkberrow on Thursday by 133 to 86 shots followed by picking up all 14 points against Bromsgrove in the Redditch Triples League the following Monday. Saturday's match against Broadway being called off because of rain! However Tuesday, 10th, saw defeats for the men in the Wardrop Cup. Losing 4 rinks to 1 against Avenue at their green...but the hot dogs were great!..followed by a defeat in the Interberga league match, at home to Redditch BC. Wednesday 4th June...A very wet day today...has rained all day...no bowling today but time to reflect on the last few days matches. First the friendly match against Wellesbourne on Saturday proved a step too far. Entaco losing all five games for a 73 to 98 points defeat. Monday saw a better result in the Redditch triples leagues first round of the Spencer Cup. Drawn against last years winners, Redditch B.C. we came away with a very creditable win by 12 shots overall. We won both games at home and one of the two away games to secure our place in the next round of this knockout competition. Monday also saw our County men's fours team win at Whitnash and move into the next round on Wednesday. Tuesday gave us another win at Bromsgrove in the Interberga league. Winning two game of the three we picked up 10 points out of 12 available. Tuesday 27th May...Another tight game against Hewell in the Interberga league but with a favourable outcome. Entaco gaining 51 shots to Hewell's 37 shots and picking up 10 points for a 2 rinks to 1 rink win. Thursday 22nd May...National Top Club competition could have gone better! Lost to Welford 3 1/2 games to 1 1/2. We had a singles win by Neil in the 4 wood and a draw by Gerald in the pairs. However the Rinks, Triples and 2 wood singles were all lost after some close games. Better luck next year! Tuesday 20th May...A good start to the week with wins at FISCC (66 shots to 62), a home win for the Redditch triples league team (74 shots to 59 and 10 points) against Droitwich and an away win for the Interberga team at Barbourne picking up another 10 points for a 2 rinks to 1 rink victory. Saturday 17th May...What a glorious sunny day it was when we played Kingsheath B. C. at home. Just the weather for bowling. Entaco eventually ran out 3 rinks to 2 rink winners. (97 to 67 shots) We are all looking forward to the return match next Saturday at Kingsheath. Friday 16th May...Karen makes the papers!. Karen Rice, our Ladies Captain, has gained her County badge. Well done Karen. See the article below. Karen on the right. Thursday 15th May...The Mens' National Two Fours took place this evening, at home, against rivals Welford. It was a very close run thing with one rink losing by six shots and our other winning by five shots. This gave Welford a one shot win overall and they progress to the next round. Winning rink was Darren Henson, Mike Varnam, Mike Osborne and Neil Brereton. Losing rink was Kelvin Rice, Mike Bell, Les Husband and Gerald Goodman. Bring on the National Top Club match, next Thursday, against Welford again! Saturday 10th May...What a windy day at Welford! And a 10 shots win for Welford...but still an enjoyable afternoon. Monday 5th May...Our second Redditch Triples league match, against Barbourne, went down to the wire with the result depending on the outcome of the last end of the final rink to finish. With 2 winning rinks apiece Entaco eventually won the match by the slimmest of margins. 68 shots to 67 shots! Saturday 3rd May...On a gloriously sunny afternoon Entaco played Brotherhood (Worcs). After 21 ends, including a break for tea at 10 ends, Brotherhood were the eventual winners scoring 112 shots to Entaco's 94. Entaco won 2 of the 5 games with our winning rink players being Maureen Smith, Harvey Brereton, Derrick Pratt and Les Husband. Tuesday 29th April...Our first Interberga league match of the season saw us run out 49 to 42 winners against Hewell Red, at Hewell. Monday April 28th...Our first venture in the Redditch Triples league provided a tough match against Stourport B. While we won two rinks each Stourport B won overall 72 to 66 shots. Sunday April 27th...Our first home friendly match of the season gave us an 80 to 66 win over a Warks County Council (WCC) team. Well done to all players on both sides for an enjoyable game. April 27th 2014..A number of members have put their names down to help keep the club grounds and green in good order. 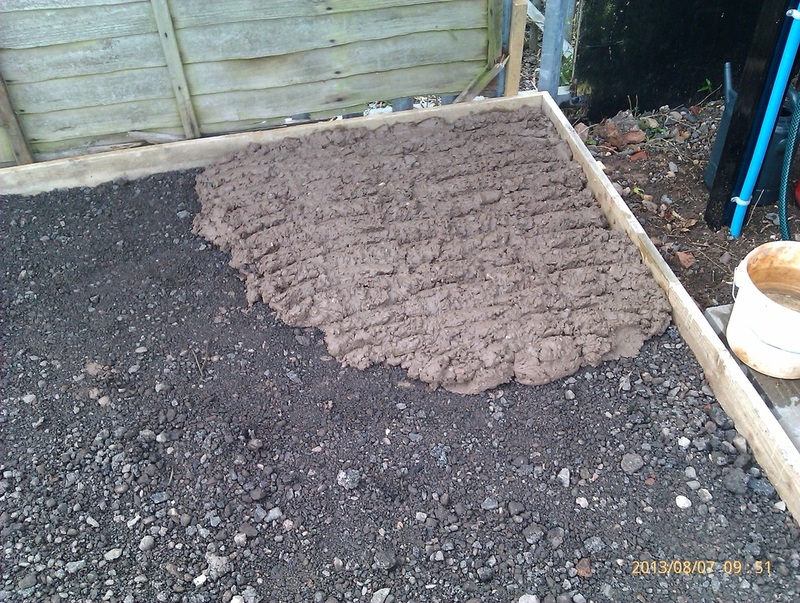 However we still need more members to volunteer to share the work load, especially for cutting the green. Please add your name to the list on the notice board. April 19th 2014...The outdoor season is now underway with friendly matches starting on Saturday 26th April and league matches starting on 28th April. Weekly Tuesday & Thursday roll-ups start commencing 21st April. See the Fixtures section for all matches. March 22nd 2014...At the last indoor match of the winter season, against Welford, our new Club Captain, Sue Birch and Club Vice Captain, Heather Cheatham took over the reins. Congratulations to both on a job well done. However the result was a 120 to 103 win for Welford. March 2014...2014...Entaco Roll-up sessions, Tuesday pm and Thursday evening have been posted on a new website named SofaDodger. This website caters for all activities and allows searches for activities within 20 miles of a location. Results show events and times in calendar format. Take a look at www.sofadodger.co.uk. Entaco is shown under 'Individual & Hobby' category at the moment. Hopefully we can encourage others to try us out. Feb 15th 2014...Our indoor match against Bromsgrove resulted in a 91 to 85 win. Well done to all including our winning rink of Joan Bell, Pat Kenneth, Phil Cheatham and Peter Bryan. Jan 25th 2014...Our third indoor match at Welford resulted in a 139 to 98 win for the home team. Let's hope we do better in our next match at Bromsgrove! Thanks to all those who took part. Jan 11th 2014... Our second Club indoor match, against West Midlands Police, was played at Bromsgrove. It was a close match with a narrow three shot overall win for Entaco. Thank you for all 6 rinks that played. Jan 8th 2014... At the AGM of the Redditch Triples League Entaco where accepted into the league and will start in Division 2. In all 16 teams take part, in two divisions. Entaco will play 14 league matches, home and away, on a Monday evening. Starting this year two teams get promoted from Division 2 and two relegated from Division 1. Also all 16 teams were entered into the Spencer Cup, a knockout competition, also on a Monday evening. In the first round we are drawn against Redditch BC, last years cup winners! More details of the league will be posted soon. Dec 7th 2013...Skittles Night at HDA club. We had over 50 members and guests turn out for our annual skittles night. After a chilly start it warmed up once both lanes were in action. The food was once again excellent and the raffle exceptional. In all we raised just over £200 towards club funds. A great night for all. Dec ? 2013... Dead tree removed. The one dead tree, on the drive close to the club, has been chopped down. Many thanks to Gerald for doing this. There is a cone nailed to the stump so do watch out when parking! Our first indoor match at Solihull went well but resulted in a narrow victory for Solihull. Thanks to all those that turned out, especially the new bowlers and those that don't normally bowl indoors. Our A.G.M. was held with 38 members attending. Reports were had from the Treasurer, Secretary, Match Secretary, Club Captain & Lady's Captain. Three propositions were put forward. The first to allow the wearing of shorts for Club competitions and Roll-ups was approved. The second to play all home matches with two trial ends and 'threes up' was dis-approved. The third to increase the annual subs to £65 was approved. Immediately following the AGM a General Club meeting was held where members expressed their thanks, concerns and ideas. We are planning to hold a further General Club meeting before the start of the 2014 season. All of the trees, each side of the drive, have had their low hanging branches removed including a number of dead branches. Working party was Gerald, Phil, Les, Colin and Mike B. Next we intend to remove the dead tree near the club. Anyone good at wood carving? We could make a nice feature of the trunk? Over fifty members and guests attend our annual Presentation Evening held in the main room of the Studley Sports & Social Club. Hosted by Derrick we had music throughout the evening from Brian, a quiz and an brief insight into Peter 's home life lead to a ploughman's supper provided by Margaret. After supper the trophies were presented by President Les to all winners and runners up. The evening concluded with 3 rounds of Irish bingo called by Pete (Sit Down Smith!) and a massive raffle. Thank you all who attended, helped and provided raffle prizes. Click on the button below to see all prize winners. 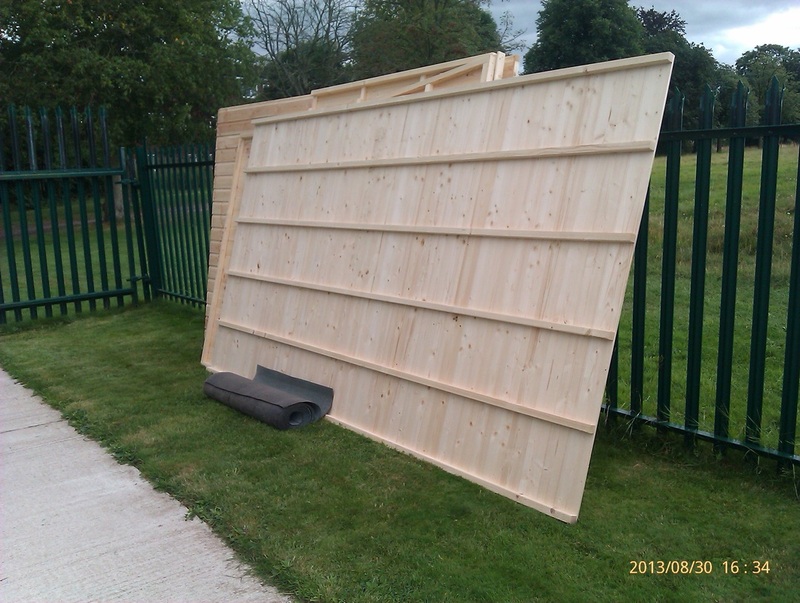 Sept 11th 2013...Say goodbye to the old field gate...it was sold on Ebay. 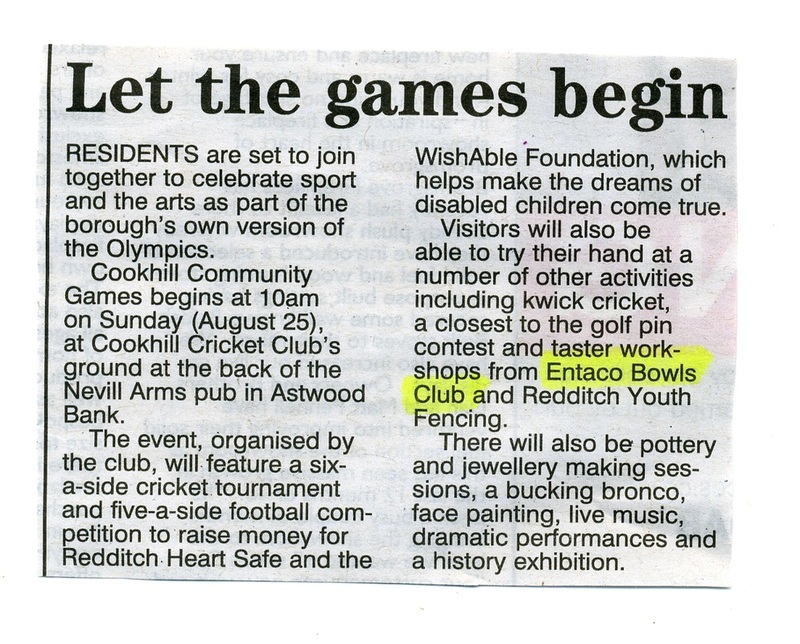 AUG 25th 2013...Entaco took part in the first Cookhill Community games at the Cookhill Cricket Club ground. A number of members took turns at offering members of the public a 'taste' of bowls. The 'green' was not the best but everyone seemed to enjoy the experience. 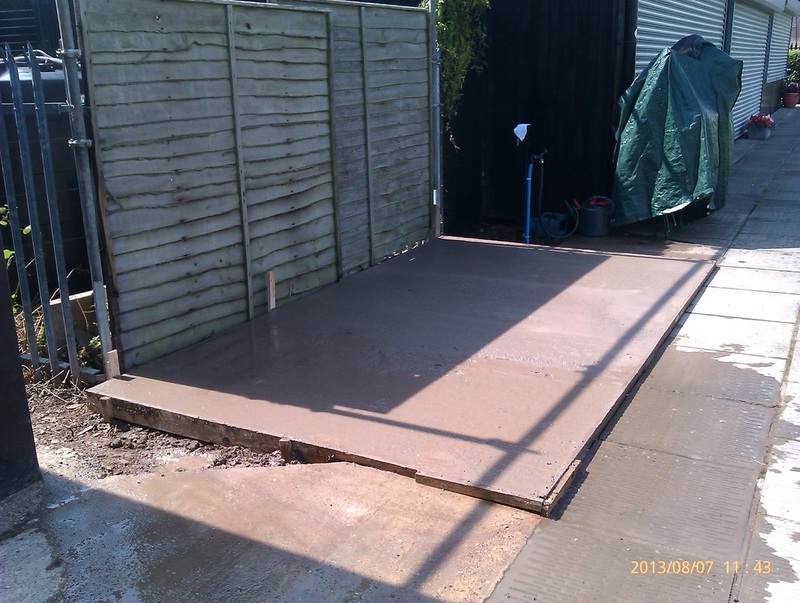 Aug 7th 2013...The concrete base has been laid for the new shed. 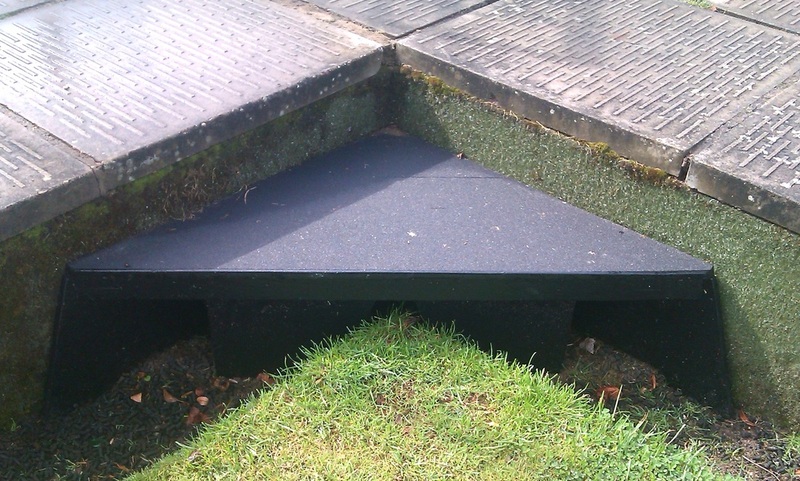 July 2013...Two small steps have been placed at the front corners of the green to allow easier access to the green. Please use them. 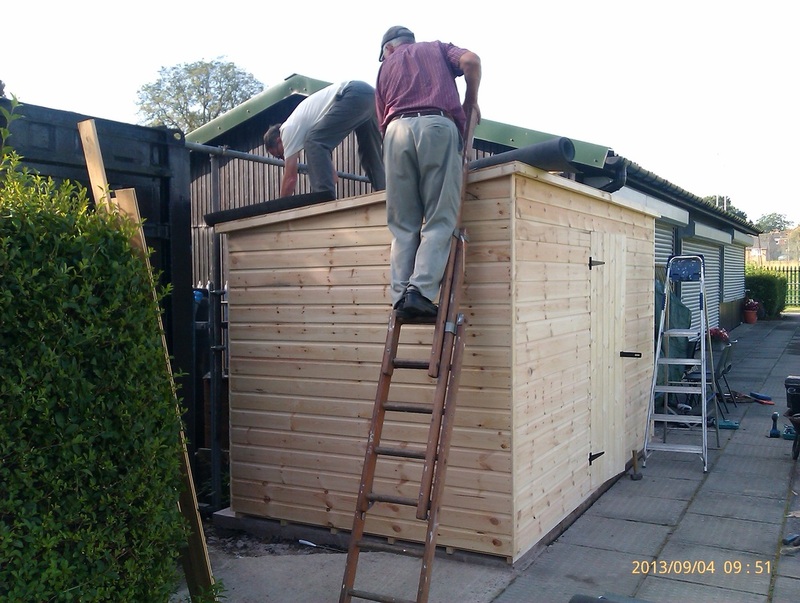 July 2013...A large shed has been ordered to house the outside chairs and gardening equipment. 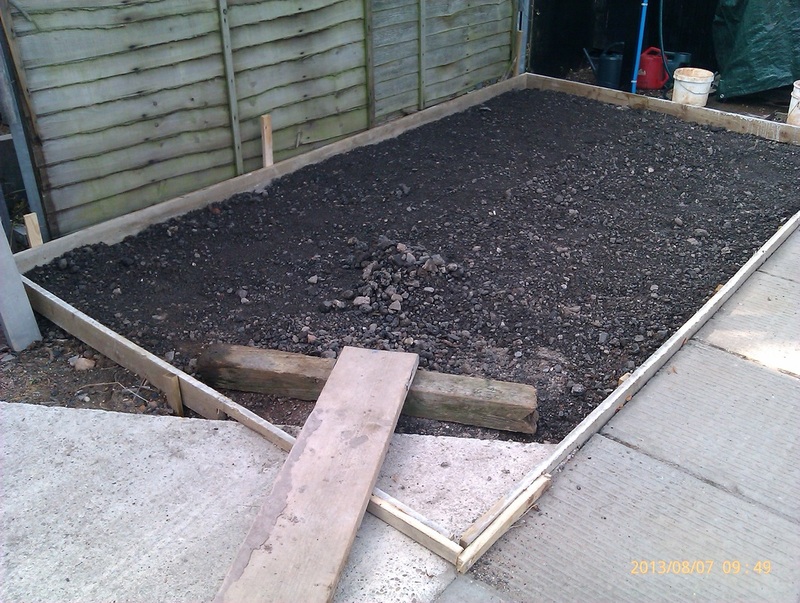 The base for the shed is being prepared including moving the stand pipe. June 2013...The area to the left of the green has had the shallow ditch filled and turfed. 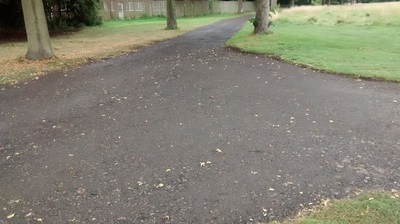 This is the area where the fence was removed a few days ago. June 2013...A new anti slip floor has been installed in the kitchen. This will also be easier to clean and thus provide a more hygienic work area. June 2013... The Club competitions draw is now on the notice board. For most competitions the first round ends by 30th June. Please arrange your games to suit. Don't forget a marker, if needed. June 2013...The chain link fence, to the left of the green has been removed. The fence was the original boundary of the green before the metal security fence was installed. Many of the wooden posts had rotted and it was difficult to get to the grass behind it for cutting. With the fence gone it is hoped to improve the look of that side of the green. May 2013...Volunteers needed to keep the ditches and hedges weed free and tidy...adopt a ditch...please add your name to the notice on the club notice board...no previous experience necessary...just 1/2 hour every couple of weeks...keep Entaco tidy! Latest...we now have 5 volunteers come forward to help keep the ditches and verges weed free...thank you all! We also need someone, or more than one, to mow and tidy the grass around the club house.